I found this in the "archives" at City Hall. It was in a folder from the 1930's. Click the image to enlarge. You'll need to sroll left and right with your mouse or arrow keys. very cool picture. lots of recognizable things there, and lots of things that are long gone. What's most shocking is how RURAL Essex Street is west of Summit Ave towards Route 17. There's NOTHING there but fields and woods. Looks like the plan for River Street was already in place, even though the traffic was minimal. Same thing for the Esplanade and Maple Hill Drive. All the streets are there, with hardly any houses. Same for the high school athletic fields west of First Street, except that wound up as school property instead of development. 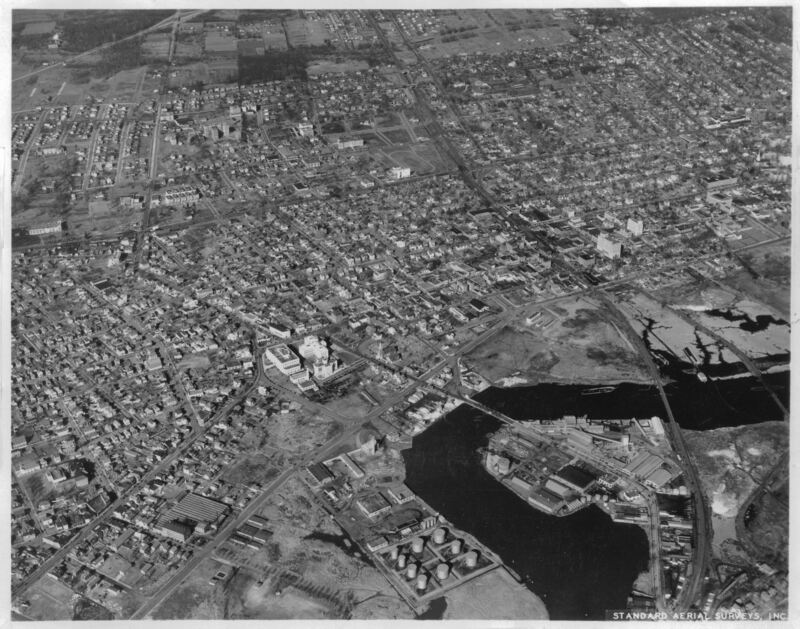 Click here for a higher resolution (600dpi) scan of the aerial photo. I still haven't confirmed an exact date for this image. Any guesses? (2) Expansions to the high school. The photo shows none, just the old 4-story part of the building. I also see housing infill beginning on Maple Hill Drive and vicinity. I tend to think that didn't happen early in the decade. I also see that the building housing the former Womrath's wasn't built yet. Interesting. When the city planned a new municipal complex, a new fire headquarters was included as a top priority. After two years of building, the fire department, on July 1, 1974, moved into its present headquarters at 205 State St. The old headquarters was soon torn down, however, part of it is still intact. Three walls of the old structure were left standing and are visible in parts of the new complex. (source). That only tells us that the picture was taken prior to 1974. I'll keep digging. Take a look at the north side of Kansas Street between Hudson and Fair Streets. The site for the Senior Citizens bldg. at 60 Kansas Street was leveled and it looks like it was ready for construction. I am sure that there is a plaque on the bldg. showing when it was dedicated. Obviously the photo was taken before the building was constructed. Here is another clue. Look at the top of the photo and at the east side of Prospect Avenue just to the north of the building at 2-4-6-8 Prospect Avenue across from the end of Thompson Street. When the HUMC finished it's first major expansion which I believe is the Link Pavilion, there was a row of housing along Prospect Avenue on the site which is shown in the photo as being vacant. These buildings were demolished in the early to mid 1970's so that Prospect Avenue could be widened and parking provided along Prospect Avenue in conjunction with the Link Pavilion project.. These properties that were demolished weren't even built yet when the photo was taken. And a third clue from Ol' Homer. Tighten up on the northeast corner of Main Street and Washington Place. The Mansion House is still standing; but, it looks like excavation has started on the property just behind and east of the Mansion House. It also looks like construction or demolition trailers are parked haphazardly on Washington Place. Soooooo if we can determine when construction started at 60 Kansas Street and the Mansion House property the outside latest date of the aerial photo can be determined. And if records can be found when construction started on the homes that were built before the Link Pavilion was built, the photo date may be even more closely defined. I wouldn't be surprised if this housing was constructed as returning veterans housing after WW 2. The image is from before 1945. Interesting. I just looked at the Housing Authority web site and 60 Kansas Street (Harry Berkie Gardens) was built in 1967. Ok, so Bob's in the lead in dating it to at least 1945. Can anyone date it earlier? By the way, look at the high res scan again. I accidentally cut off the far right side (Passaic Street) in my first upload attempt. Now you can see the full image. The enlarged view of the picture shows that the Oratani Theater hasn't been built yet and the Prospect Ave Train Station is clearly on American Legion east of Prospect. Once enlarged and time spent... a lot of things become obvious. Pretty cool ! I am not so sure that the Oritani Theatre wasn't built at the time of the photo. Look at the Fox theatre in the photo. The stage or screen area was at the western part of the building. When theatres of that era were constructed, the stage area was always built higher than the seating area since stage sets were raised and lowered from hoists above the stage area. Looking again at the photo you can see the seating area under an arched roof where the patrons were facing the westerly direction toward the stage. Now, lets walk across the street to the Oritani Theatre site. At the Oritani Theatre, the stage was at the south end of the building behind the stores on East Camden Street and the building extended north from the stage so that the patrons were seated looking south. The entrance was on Main St. perpendicular to the seating. Although it is difficult to see the building in it's true perspective, you can see a high stage area adjacent to East Camden Street with what looks like two ducts on the roof. Looking closely, you can make out the seating area so that the patrons would have been looking south towards the stage. It is hard to see the Oritani; but, if you know what you are looking for, you can see the theatre.